Forgot password? | New account? Synopsis: Girls Trip's Regina Hall and Black-ish's Marsai Martin both star as Jordan Sanders"all as the take-no-prisoners tech mogul adult version of Jordan and Martin as the 13-year-old version of her who wakes up in her adult self's penthouse just before a do-or-die presentation. 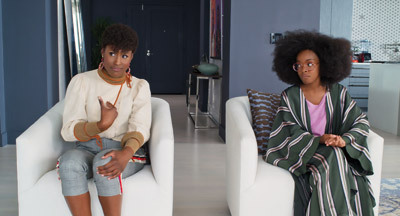 Insecure's Issa Rae plays Jordan's long-suffering assistant April, the only one in on the secret that her daily tormentor is now trapped in an awkward tween body just as everything is on the line. Little is an irreverent new comedy about the power of sisterhood and having a second chance to grow up"and glow up"right. 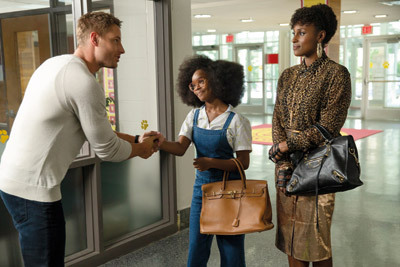 While Hollywood has a rich history of funny, engaging body-swap comedies, it took a then-10-year-old Marsai Martin to notice a rather obvious cultural gap. None of those movies was about black girls or black women. "It was during season one of Black-ish when we were on hiatus," says Martin, who's now 14. "It was the first time I learned what a hiatus was. So I thought, 'Ok, we're on a break, how about we create something?' There weren't a lot of little black girls with glasses that looked like me on TV or in movies, so I just wanted to create something where you see more of myself and what you look like." In a conversation with her mother, the concept for Little was born. "I think this film can actually inspire girls and teenagers like me to realize that it doesn't matter how old you are," Martin says. "You don't have to wait until you're a certain age if you want to create something. When people see this film, I want them to take away the fact that they can do anything at any age. I don't care if you're 7, 2 or 82, you can do whatever you want at any age and at any time and you can impact other kids like me." Martin and her parents, Josh and Carol Martin, took the idea to Black-ish creator Kenya Barris. "Kenya suggested we take it to Will Packer Productions," executive producer Josh Martin says. "We didn't really need to sell it; it was more about Will hearing the idea. He was already sold on Marsai and her capabilities." Carol Martin adds: "Will Packer Productions was the perfect home for this idea. When we told them the concept, they just got it." Packer, who has become one of the most prolific and successful producers in the industry by creating top-tier entertainment that celebrates black characters, lives and experiences, immediately connected with Martin's idea and saw its potential. "Josh and my good friend Kenya came into my office and pitched me the story and I loved it," Packer says. "Marsai was in the room and acted out some scenes, and I could just feel the energy and see that this was a movie we hadn't seen before. My youngest daughter is the same age as Marsai. I realized that there aren't a lot of aspirational movies where she can see herself on screen or identify with the protagonist, and I thought Marsai's idea was a very cool concept." In addition to being a concept with limitless comedic potential, it was anchored by timely and important themes. "This movie is about a magical event that happens and how a young girl can turn a curse into an actual gift," Packer says. "There are some really important messages in this movie about being true to who you are. The film is about being stronger by using the people around you rather than putting them down. We're all stronger when we're working with other people versus doing things alone." Plus Martin impressed him, to say the least. "Marsai, a little 10 year old, came in and pitched a movie to a Hollywood producer," Packer says. "Who does that? She was really clear, self-assured and confident in the way she saw this movie playing out. I thought, 'Damn. I might need to work for you someday.' And I might." Packer's producing partner James Lopez adds: "Marsai pitched the concept, which we thought was great. She is super talented, wise beyond her years and nothing surprises us in terms of the ideas that she generates. She and her family are great partners. She has a very bright future." With Packer on board, his team, including Martin, eventually met with Universal executives. "It was just all of this big ol' stuff going on, and it just got bigger from there," Martin says. "It's truly a blessing and I'm very grateful." Packer and his team now had an exciting, innovative concept but needed to develop it into a filmable story and script. Tracy Oliver, who had co-written Girls Trip with Barris, was brought in to create a formal narrative around Martin's idea. Martin herself stayed involved in each step of the process. "Marsai always had a vision for how she wanted this movie to come together," Packer says. "It was good because she was able to step back and allow me and my team to do what we do, but also give her input at times. She was a student of the game but also knew how to make her voice heard when appropriate." Over a few years of development, the story evolved. Tina Gordon, the writer of the 2002 sensation Drumline and the writer-director of 2013's Peeples, was hired to work on the script and eventually to direct the film. "We landed on Tina Gordon to rewrite the script early on in the process," producer Lopez says. "While we were going through the development process, Will and I advocated for Tina to be the director. When she met with the studio, she knocked the meeting out of the park and we've been partners ever since. I think it's important for the cast to see an African-American woman at the helm, not only writing but also directing this project." For Gordon, the decision to direct Little was not one she made lightly. "I was nervous when Will asked me to direct," Gordon says. "He has such an amazing track record and his intelligence about filmmaking is unmatched. He works so hard and puts it all into his productions. I think audiences feel and respond to that. He has a unique gift, and I was definitely nervous about that, but I didn't want to let him down. He was so supportive about the idea of women coming together to support each other." The final script, and the film, touch on themes of self-empowerment, personal evolution, the impact of bullying and the importance of lifting up those around you to aspire to be their best selves. It also features the first ever portrayal of a black female tech CEO on film. "Little is about Jordan Sanders, a hard-driven woman who is very accomplished in her career," executive producer Preston Holmes says. "At the same time, she has paid the price in terms of her personal relationships. She made a decision early in life that she would put her guard up in hopes that this would prevent her from being hurt again. Over the course of the film, she's transformed into her 13-year-old self once again, allowing her to rethink and relive moments of her past." Jordan had been bullied in middle school for being smart, and the film deals directly with the long-term impact of that young-adolescent experience. "Jordan has isolated herself because she was hurt as a child," Gordon says. "She's carried a tough exterior in her adult life and, through magic, she wakes up as her younger self. When she's little, she can see how much she has allowed bullying to change the spirit of who she is on the inside." Jordan's transition back to adolescence also dramatically alerts her relationship with her beleaguered assistant, April Williams. "I think April and Jordan crossed paths to teach each other something," Gordon says. "April could use some of the gumption and shark-like behavior of Jordan. Jordan could learn to take some of her layers off and how to be an actual friend. It's a story about mentorship really. It's about learning from your protégé. In the film we see April and Jordan's relationship change from very one-sided to a true friendship." Ultimately, the film speaks to universal themes and ideas that all people can relate to. "This is a film about being your best self," Lopez says. "If you could go back and relive a moment in your life and change something, what would you do differently?" It's an inspiring question that should resonate with audiences of all ages. "This is definitely a multi-generational movie," Josh Martin says. "I think it's a film that is going to last forever." 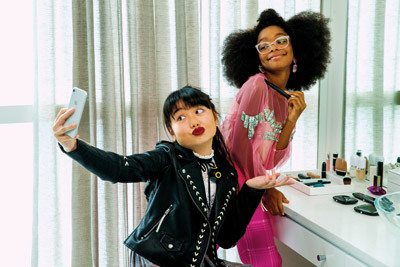 It's also, Marsai Martin emphasizes, just flat-out funny. "I think families will enjoy how hilarious this movie is," she says. "I think it's something that both kids and adults can laugh at and relate to." That is a rare combination of qualities for a comedy, which is part of the reason everyone involved in the making of Little became so invested in getting in right. "This film has the potential to appeal to a vast array of audiences," Holmes says. "Not just women, but anyone who appreciates a comedy with heart. It's the kind of comedy that's also thought-provoking and poignant. I love working with Will, James Lopez and Universal, so I was thrilled to be involved again." When we first meet Jordan Sanders in the film, she's a 13-year-old girl demonstrating a massive science experiment at a middle-school talent competition, and she is being mocked, teased and bullied by her classmates. The experiment doesn't quite go according to plan, and Jordan ends up in the emergency room, where her parents advise her that smart girls, when they grow up, get to be bosses and can do whatever they want. Jordan takes that to heart, but with unintended consequences. When we see her again as an adult, she's the CEO of her own tech company, JS Innovations (JSI, for short), but has become a monster of a boss, bullying those who work for her instead of showing them compassion, kindness or even basic respect. "After growing up, Jordan thought, 'forget that, I'm going to be the boss one day and, when I'm the boss, people are going to look up to me and respect me,'" Issa Rae says. "So in turn, she bullies people as an adult, until one day, she's cursed to become her former child self and it's a nightmare for her." From the beginning of the development process, Martin wanted Little to explore the impact of bullying, and for it to be an essential part of Jordan's character. "Bullying is a very relatable topic in schools these days," Martin says. "I'm excited to talk about it so people can understand how bad it really is. I'm very glad that the film is honest about it because it's a very sensitive topic in our schools right now. Our writers Tina and Tracy are great and they wrote it in so well." Martin's fellow filmmakers embraced the idea. 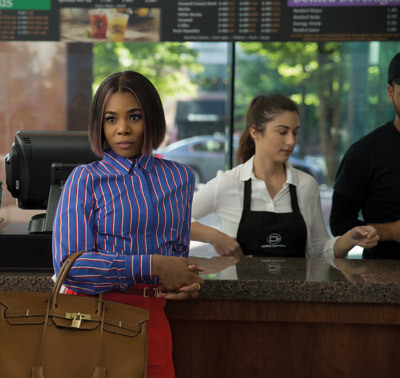 "What I think is so magical about this story is that Marsai picked this," says star and executive producer Regina Hall. "There are so many issues with bullying today, and she picked this story for people to see what happens to someone who is bullied. Jordan becomes a bully and then realizes that she was acting that way just because she didn't want to be hurt. I thought the way the story was handled was amazing, and the fact that this is what Marsai wanted to say was also so wonderful." The fact that this serious subject matter is woven seamlessly into a riotously funny comedy is even more impressive. "The writers did an incredible job with telling the story about what happened to Jordan," Hall says. "I think people have all been in situations where they've been bullied or have been the bully. When Jordan is bullying her employees, the idea is to try to make sure every character is seen as human. My hope is that audiences can see how ridiculous and hurtful bullying is. Bullying doesn't come from a place of strength. Bullying actually comes from a place of weakness. It's a lonely place, and we discover that through Jordan." The goal for the filmmakers was to use the topic to give emotional weight to the film without weighing it down. "There is a lot of focus on bullying these days, rightly so," Holmes says. "Kids can be cruel to each other, and that's always been the case. The difference these days is social media, which can take bullying to a different level. I like that a couple of points are made about bullying by the end of this film. The first, just the fact that bullying others is cruel. And the second, the fact that the perpetrators are often people who are damaged or have been hurt. It's all done in a somewhat lighthearted fashion in our film, but it's an important topic that I'm glad the film touches on." Gordon saw it as an opportunity to convey empathy and compassion for kids watching the film who have been bullied, and to show them that they can survive it and still be OK. "Bullying comes at such a vulnerable time in teens' lives," Gordon says. "I wanted to send a message of encouragement to kids who are in that situation through this film. When I was a kid, I defended kids that were bullied. Looking back at that now, it's what I'm the most proud of from my childhood." 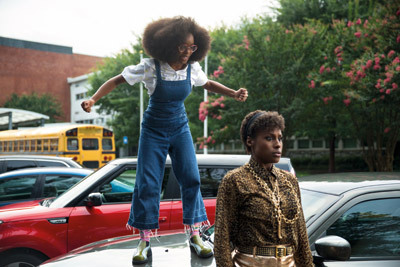 The idea of black girl magic is both literal and metaphorical in Little, and the concept eventually expanded to every area of the film's production. On a narrative level, it is literal black girl magic that transforms Jordan Sanders into her 13-year-old self. Early in the film, Jordan is terrorizing her employees and being brutally rude to April in front of Stevie (Marley Taylor), a little girl whose father runs a donut truck outside Jordan's company, JSI. April has always been kind to Stevie, and Stevie comes to April's defense. Stevie confronts Jordan, and when Jordan refuses to apologize, Stevie waves a magic plastic wand at Jordan and makes a wish that Jordan become little again. The next morning, Jordan wakes up in her 13-year-old body. "I don't like little Stevie," Regina Hall jokes. "She may be awfully cute and magical with her little plastic wand, but she actually makes Jordan little. That actually ends up being kind of a blessing in disguise because it changes the course of Jordan's life. That little Stevie." 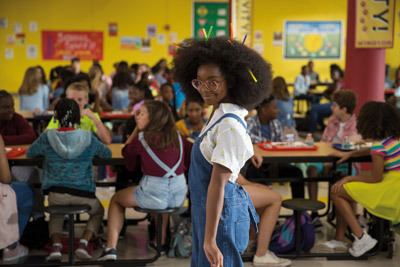 In a broader sense, though, black girl magic refers to Marsai Martin herself, who conceived the film in the first place. 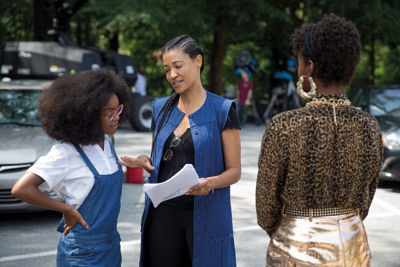 So, the filmmakers seized the opportunity to hire as many black women as they could for as many areas of production as they could, celebrating their talents, brilliance and creativity. "The first bit of black girl magic was Marsai pitching the film to Universal," Gordon says. "That would be a miraculous thing for an adult to do, so for a child to do it, it's quite the magic trick. So I started thinking about the black women all over that are doing these small and giant miracles every day. I wanted to add women behind the scenes, artists and women of the world to the production to contribute their black girl magic every day." Not only is the cast lead by three extraordinary black women, but Gordon and Tracy Oliver are black women, and black women were responsible for much of what audiences will see on screen. "There are a lot of amazing women who are a part of this project," Hall says. "Tina is so amazing. Marsai is obviously magical, and Issa is incredible. We used amazing black artists, designers, wardrobe, hair and makeup artists. I mean, there are just so many phenomenal women on this film. It's been wonderful to wear clothes from black designers and to be able to support one another in such an incredible way." Hall's co-star, and everyone else, loved being able to do that, particularly for this film. "The black girl magic came strong with this one," Rae says. "I think Will had a vision. He's been really great about championing women and girls, and this movie in particular is such a women-heavy storyline, both in front of and behind the camera. With Tina directing, Marsai pitching the film, and me and Regina involved, we all worked together to make this the best movie possible." Packer did, in fact, have a vision, and he was thrilled to see it realized. "These women are the epitome of black girl magic and the movie itself is magical as well," Packer says. "I had a very unique and awesome opportunity to highlight and showcase black women and their talent. Every chance we got, we tried to use black female artisans, and that was very important to Tina as well." Lopez adds: "The movie is whimsical and magical and we wanted to keep that theme throughout the development process. Will and I constantly spoke about finding a project that spoke to a whole generation of young girls that are underrepresented in film. We are so happy that we were able to execute this project in such a way that inspires its intended audience and beyond. I want audiences to go in and have an enjoyable time watching amazing African-American women in all their black-girl-magic glory." Martin was elated by it all. "I mean, we had painters that were black girls and clothing that was black-owned," Martin says. "There's just a lot of powerful stuff happening in this film that I think can actually inspire people." Martin herself has already inspired her co-stars. "Hearing that Marsai pitched this at 10 years old honestly made me think about what I was doing at 10 years old," Rae says. "I wasn't doing as much as her, but I had dreams. At 11 I wrote scripts and sent them to networks but got rejected. So to hear that at 10 years old, she had this concept and pitched it to Will Packer's company is just so amazing and inspiring. There isn't a lot of young-black-girl representation, so when young black girls hear about Marsai pitching this movie, they will think, 'Wow, maybe I can do it, too.'" Rae, and all the women involved in the film, wanted to give something back to Martin for her vision and drive. "Women came around Marsai to support her," Gordon says. "They lent the magic that they've created in their own lives to lift her up while she made her first feature. Marsai's gumption and spirit are amazing. The fact that she brought this idea to life really grounds the idea that there are young black girls in this world doing incredible things." For Martin, the whole process of making Little became a master class in filmmaking, one that will guide the next phase of her career and beyond. "I've been on Black-ish for about five years, and I've learned that making a movie is totally different from a TV show," Martin says. "I never realized how long the process of moviemaking was until I came into this, especially being in front of and behind the camera. A ton of work goes into it." February 2019, Martin and her company, Genius Productions, entered into a first-look production agreement with Universal Pictures, making her the youngest filmmaker ever to receive a production pact with the studio. That, Packer says, is just as it should be. "I think it's so important for Marsai to be creating and telling her own stories and to be part of the production process because the actors that do that are the ones who have the most longevity in the business," Packer says. "Those actors take control of their own images, careers and opportunities. There's no one in this space quite like Marsai. No one that looks like her, is her age or is as driven as she is. She's created an opportunity for herself, and I have no doubt that this movie will be a launching pad for her. You certainly haven't seen the last of Marsai and the productions that she'll be behind." The adult Jordan Sanders we first meet in Little is a nightmare boss, living in a glamorous penthouse, yelling at her assistant April Williams over the phone. In fact, you could say that yelling is basically the cornerstone of her management style. "Jordan Sanders would scream right now," Hall jokes. "Jordan is smart, driven and incredibly sensitive to a fault. Her motto is to hurt before being hurt and to always be the one to strike first. Her employees would probably describe her as a tyrant or a monster because she's kind of like a little spoiled demon. But she's also quite charming when she wants to be. Like most people, Jordan is a mass of complexities. She's crazy, but that's why she was so much fun for me to play." Jordan has created a massively successful tech firm, JS Innovations, and has invented a virtual assistant called HomeGirl, which is like an Amazon Alexa but with a lot more personality. Jordan is rich and lives in ultimate high style, but she doesn't form close connections with anyone. "Jordan's career is exceptional," Hall says. "She's been on the cover of pretty much every tech and company magazine. She is cutting edge, and she loves winning. Her company builds apps, software, hardware and games. The company is innovative in the tech world, and Jordan is always coming up with new ideas; and you can see in the movie that she's been innovative since she was a very little girl. So now, she's found a space where her nerdiness can be chic and cool." She has earned the right to be entitled, but that doesn't make her any more pleasant to be around. "Jordan can cut the line at Starbucks because her money entitles her to do whatever she wants," Hall says. "I don't think Jordan thinks about other people's time or needs. Jordan doesn't think she has to play by the rules because she thinks she's above the rules. Jordan's priority is Jordan." That narcissism, and that isolation, is reflected in everything from her wardrobe to her car to her penthouse apartment. "Jordan is basically at the top of the world," Gordon says. "Her home is her fortress and it's full of sharp edges and cold marble. There's nothing warm or fuzzy about it. She lives at the top of the world overlooking the Atlanta skyline, which symbolizes how detached she is from the rest of the world." Her clothes are custom-made and are designed to make a statement. "Jordan is fashion-forward and not conservative by any means," Hall says. "Her wardrobe, hair and car create attention. She's bold, loves color and isn't afraid to be seen." She's impressive, if terrifying. "Jordan is a strong, powerful black woman," Martin says. "She doesn't care what you think. She has an amazing house and is kind of spoiled. No one likes her because she's very mean. She doesn't care about anyone else or what they think. She just does her own thing." Without context, Jordan would be a hard character to root for, but because the audience knows, before we first meet adult Jordan, about her years of being bullied for being smart, she's still a sympathetic character. We know where her behavior is coming from. Plus, her insults to people can be incredibly funny, even if they're cruel, and Hall imbues her with a strength and charm that make her almost impossible to resist. "Jordan is unapologetically rotten, but you still love her," Hall says. "At least I do. She has a lot of fruit to show for her hard work, ethics and perfectionism. She pretends to have a high sense of self, but I think Jordan is actually really insecure." Packer agrees with that interpretation. "Jordan had a rough childhood," says Packer. "She was super smart but was picked on. She found that being herself, her little beautiful, nerdy, quirky black-girl self, didn't make her endearing to the other kids in middle school. So she vowed that she would work hard to become in charge and be the bully when she got older, so they could never bully her again." That may make her relatable, but it doesn't make working for her any more fun. She berates and belittles her staff constantly, and motivates people through fear and intimidation rather than by empowering them. "I think the world of science and creativity were very exciting to Jordan starting at a young age, but she abandoned her kindness when she went into self-protection mode," Hall says. "The work environment at JSI is tense for the employees. I would just say that Jordan has high standards and if you can't meet them, then you shouldn't be there. Unfortunately, she's not the best at listening to her employees." Hall has worked with producer Packer on multiple films, and so she first heard about the idea for Little almost from the beginning. "I became involved with Little a few years ago," Hall says. "I know Kenya Barris and I work with Will Packer a lot. I'm a big fan of Marsai and had worked with Kenya and Tracy Oliver on Girls Trip. So Will told me about the idea during the early developmental stages and I was really excited about it. I thought it was so great for young girls and women to see a story that was magical and had such a beautiful arc about friendship, trust, vulnerability and what it means to be kind." Hall would eventually sign on to not only play Jordan, but to become an executive producer on the film. "This has been a perfect project to be the first that I executive produce," Hall says. "Instead of just having the credit of executive producer, I was actually able to participate in what it really is. I'm really grateful and I feel really lucky." Gordon was grateful to have her in such a prominent role on the film. "I love that Regina is an executive producer and that she was on set to lend her support," Gordon says. "Her comedic instincts are selfless, sharp and quick. She's a smart woman and collaborating with her definitely elevated the movie." The central relationship in the film is the one between Jordan and April. "It's established in the first couple scenes of the film that the relationship between April and Jordan is borderline abusive," executive producer Holmes says. "Jordan is unreasonably demanding of April, but being the person she is, April just rolls with the punches. Once Jordan becomes little, the power dynamic switches. While Jordan is still April's boss, she's put into a position where she's almost completely dependent on April to function. So April uses that as an opportunity to turn the tables and make Jordan give her a little more respect." The power dynamic between Jordan and April flips, and their relationship deepens into something more honest and human and real. "When Jordan becomes little, the only person who knows is her assistant, April, and you see the journey that she and April go on from being boss and employee to being friends and partners," Hall says. For her part, Hall found that playing Jordan was liberating in ways she didn't expect. "It was really fun, I got to yell at everyone," Hall jokes. "It shouldn't be fun, but it is. I don't think I've ever played someone this horrible." Her co-star Rae thinks she perhaps got a little too into it, maybe? "She's mean," Rae jokes. "She's really good at being mean, which makes you ask yourself, 'What kind of person is able to tap into being mean so easily?' I'll let you come to that conclusion yourself." Seriously, though, Hall and Rae loved working together. "Regina has been really great to work with on set," Rae says. "A lot of the improv jokes in the movie came from her. She's just really funny. Right after we began shooting together she was already cracking me up." Josh Martin adds: "Regina's dope. I've known her for about two years, and she's amazing. She always makes me laugh." Little was also a welcome opportunity for Hall and Packer to collaborate on another film after many past successes. "Will and I work well together," Hall says. "Will is very easy to talk to and to collaborate with. He loves what he does and he's smart about it. His goal is to make everyone amazing. He loves making black women be, look and feel fabulous." And she admires his taste in the stories he chooses to tell on film. "Will isn't afraid to shine a light on new things," she adds. "To some degree, it's just a very comfortable relationship and we've just had a lot of great success." Hall and Packer have also clearly developed an ease with each other that allows him to tease her pretty mercilessly. Case in point, his response to a question about working with her. "If you think about Regina's best work, Packer's involved," he jokes. "Regina is well produced. I mean, sure, there's talent, right? But when you think about her best moments, you think about Girls Trip, Think Like a Man and About Last Night. Those are actually the only Regina Hall movies I even remember because they're the best. We're very close because she knows that I have her back and I make her great. She's okay without me but she's great with me. She would agree with everything I just said, but don't tell her until I leave." If you think your job is bad, or that your boss is a monster, you can take some solace in the fact that April Williams has it worse. "April is Jordan's assistant who just wants to be promoted," Issa Rae says. "She just wants to come up but she lacks the confidence to be able to ask for what she wants because she's been bullied by Jordan. I think it's that classic story of women in the workplace being afraid to speak up about what they deserve. April has this amazing, fresh voice that Jordan has been looking for, but every time she tries to speak up, she gets crushed." On the surface, April appears to be the opposite of Jordan in almost every way. "I look at April as a woman who probably joined the company to be like Jordan one day," Gordon says. "That is, until she got to know Jordan." And their styles are completely different. "April's style is bohemian and eclectic," Gordon says. "She doesn't have the highest salary, but she's very artistic and creative. Her home is filled with antique objects and items from flea markets. She's very imaginative." The first scenes in the film highlight the stark contrasts between them. "We see Jordan's extravagant closet and then April's rack of clothes," Rae says. "April doesn't even have a car; she's over here riding her bike in the heat. She's a bit meeker than Jordan for sure." If Jordan's journey is about learning that kindness does not make you weak, April's is learning that strength and self-confidence don't have to make you a narcissistic monster. "April knows what she wants," Rae says. "She's really creative and talented, but she hasn't learned to grab life by the horns like Jordan has yet. April is abused by Jordan. Their relationship is tough. I don't know that I could personally do it, but April feels like she needs Jordan and needs to take Jordan's abuse. To some degree, April is happy being the victim and not-so-happily suppressing all the anger and the things she wants to say to Jordan. She needs to speak up for herself; Jordan takes advantage of using April." Jordan may never hear (or care) what April is really thinking, but Rae gives the audience a pretty good idea. "If April could say anything to Jordan, I think it would consist of a lot of four-letter expletives," Rae says. "I think hands would be involved. But, she can't do that. I think, at the end of the day, April just wants a shot." She gets that shot when Jordan wakes up as a 13-year-old and April suddenly finds herself with some leverage, and some power. The day before Jordan wakes up little, JSI's top client, Connor (Mikey Day), demands a presentation of new ideas or he'll be taking his business elsewhere. With Jordan not able to do the presentation as her teen self, she will have to rely on April to not only keep the office running, and hide her absence, but save the future of the company. "April has been wanting a chance to be a creative exec," Rae says. "Now that she knows that Jordan needs her, she finally gets the courage to stand up to her." Jordan's transformation proves to be the beginning of April's, too. "In the beginning of the film, April is just starting to understand who she is and what she brings to the table," executive produce Preston Holmes says. "At the same time, the audience can see that her efforts are suppressed by her boss, so one of the major arcs in the film is when April grows and comes into her own." Unfortunately, having a 13-year-old boss isn't nearly as much fun as it sounds. There are…complications. "Once Jordan becomes little, you'd think April would be free," Rae says. "However, by way of circumstance, April is roped in by Child Protective Services. She has to help Jordan as her legal guardian, which she uses to her advantage by telling Jordan that she'll be her legal guardian as long as she hears her pitch." The dynamic between April and Little Jordan evolves into something almost maternal"or an older-sister-younger-sister dynamic"and they both gain a greater understanding of each other in the process. "April is kind of a caretaker to Little Jordan," Martin says. "So Little Jordan learns how to love April and understand what she's going through." Hall adds: "The great thing about when Jordan turns little is that April learns to speak up for herself, and Jordan learns what it's like to have a friend." The casting of Rae in the role was crucial because in the wrong hands, April could quickly become a passive doormat of a character. That was never a concern with Rae. 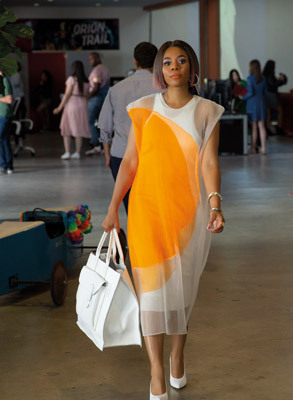 "Issa has such a different sensibility, tone and voice that bring something to the character of April that no one else could bring," Packer says. "She has quirks and a little bit of awkwardness about her, and that's her trademark. It's very natural and works really, really well in April's character." Her ability to make literally anything funny raised everyone's game. "Issa's comedic timing is impeccable," producer Lopez says. "I don't think there's anyone else who could deliver lines and throw shade in the nonchalant way she does. There aren't enough superlatives to describe what she brings to this role, but it's beyond what we envisioned." For both Hall and Martin, who had to play Jordan opposite her, Rae was a dream scene partner. "I met Issa years ago, after Awkward Black Girl but before Insecure," Hall says. "She's so talented and has such a likeability about her. She has such a quick wit, her timing is great and she makes it seem effortless. She's creative, refreshing and beautiful," Hall says. "We were really lucky to have her because she's able to play April so convincingly and you just root for her. She's really great and this is just the beginning for her. There's only more to come and more to discover with Issa." And the Hall-Rae chemistry surpassed everyone's already high expectations. "Issa and Regina are brilliant actresses and great comics," Lopez says. "They injected new energy and thoughts into scenes that we didn't even think of, and their comedic timing made the scenes even better." For Martin, acting opposite Rae was everything she'd hoped for, and more: "Working with Issa was surreal to me because I've known about Insecure and Awkward Black Girl and she's been such an inspiration to me and other young black girls." 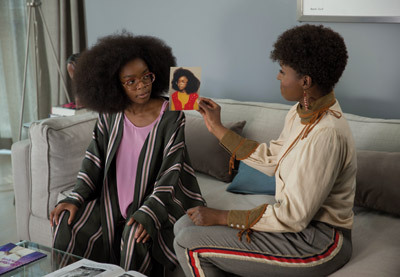 In addition to sharing the role of Jordan Sanders with Regina Hall, Marsai Martin was tasked with playing two distinct versions of Little Jordan: The 13-year-old Jordan from the past, before she grew up, and the grown-up version of Jordan, now trapped in a 13-year-old body. "In the early '90s, Little Jordan was very smart, but she was bullied in junior high and never got over it," Lopez says. "She wasn't very fashionable, wore thick glasses, had acne, wore braces and hadn't blossomed yet. When she comes back as an adult in a 13 year old's body, she's now the bully. She's more fashionable, has financial means and uses her knowledge and experience to try to navigate through the same junior high that she once went to." Before she grows up and becomes a bully boss, Little Jordan is earnest, enthusiastic and mystified by the cruelty of others. "I love the character of Little Jordan," Gordon says. "I love how she pursues her love of science and is so open-hearted. She believes that if she shows her talent, the world will love her." And she has grown up in a supportive (if uncool) home. "I think she came from parents who were similar to her," Gordon says, and then laughs. "I think it's a family of nerds." Martin easily connected with that original Little Jordan. "When you see Little Jordan, you see her as a typical 13-year-old girl," Martin says. "She's quirky, smart, loves science and is a very sweet girl. She's totally different from adult Jordan." After adult Jordan becomes little, she definitely has an edge, and an attitude, that the original teen Jordan never had. "Present-day Little Jordan is so comedic because she has the resources," Gordon says. "She has the black-card resources to cover up who she was in the past. So she gets to be little again using all of these resources, which is so funny." And Martin played her with the comedic timing of an actor twice her age. "Some kids are old souls," Gordon says. "Marsai has an innate understanding of human nature and is professional beyond her years. She is a joy to work with." For Martin, playing present-day Little Jordan allowed her to explore some pretty deep character psychology. "Little Jordan in the present day is the same as Big Jordan, just in a different body," Martin says. "She's panicking about the person that she's turned into. It's during this time that she basically learns how to be herself and discovers that she doesn't have to put on a show to make people feel good about themselves. She learns what's right and wrong and that she doesn't have to be a bully to get people to listen." Also, it was a lot fun getting to do and say adult things and wear adult clothes. "I had so much fun with the costume changes," Martin says. "Jordan is basically a style icon." And she can get away with things that no real teenager could. "In the scene when you first see adult Jordan as Little Jordan, she doesn't look like a grown lady, but she has the demeanor of one," Martin says. "She's just a mean person in this little kid's body. Her walk is different, she thinks she has an awesome body and you see all the tracks coming out of her hair. She's hungover and not sure if she's actually little or if it's the alcohol talking to her." When Little Jordan is forced to go back to middle school, though, her old insecurities flare back up. Not welcomed by the popular kids, she finds herself relegated to the outcast area of the lunchroom, known as the Friend Zone. Gordon loved the double meaning behind that name. "I thought of the Friend Zone when I was thinking about being in the Friend Zone as an adult," Gordon says. "Once you're in the Friend Zone, you can't get out. So somehow, this translated to the physical space of the Friend Zone at the school. The kids in the Friend Zone welcome Little Jordan into this safe space where bullies aren't allowed to bother them." Middle school, it turns out, is a whole new social landscape for Little Jordan to navigate, and she has to find a way to use her powers to improve the social status of not only herself, but her new low-tier pals. "We all remember the Friend Zone kids," Packer says. "They were awkward, nerdy, embarrassing and no one wanted to hang with them. No one else would sit with them in the cafeteria. That's who the kids in this film are, and it's fun because at the end of the day, we feel for them and they have their moment." "Jordan remembers those days because she was one of them," Packer continues. "They didn't call it the Friend Zone when she was in middle school; she was just the outcast who was ostracized. Little Jordan is that same person with a big, puffy afro, nerdy glasses and braces, and she ends up back in the Friend Zone with these kids. It's really fun to see them interact and to root for them. These kids are super cool and do a great job portraying the nerds that you love." With her money and confidence and refusal to be second best, she eventually rallies the kids to become their best selves and becomes the best version of herself in the process. The goal, she discovers, is not to become popular or powerful, but to embrace your true self with all your quirks and eccentricities. "Jordan becomes the ring leader of the Friend Zone kids and learns so much from them about what's really important," Packer says. "She learns that being yourself is good enough." Most of the humor in the film, though, comes from Little Jordan's interactions with the adult world, and the scenes between Rae's April and Martin's Little Jordan were a blast for everyone involved. "My favorite scenes to shoot were the buddy-comedy moments between Marsai and Issa," Gordon says. "I was nervous about what the pairing would be like because of their age difference, but because Marsai is such an old soul and Issa has such great comedic timing, they ended up being a hilarious comedic duo." One moment in a bar remains a highlight for Martin. "My favorite scene to shoot was definitely when I was singing on top of a bar with Issa," Martin says. "I loved it because I love Mary J. Blige. It was so funny to sing with her, and we kept doing it, which I loved. Plus, I was just singing to a breadstick." The comedic energy between Martin and Rae created some of the film's most hilarious moments. "What Issa brings to the character of April juxtaposed against Marsai's boisterous character creates a really fun pairing," Packer says. Rae enjoyed it, too. "Marsai is a dream to work with," Rae says. "She's so much fun, smart and full of life. She makes such smart acting choices, and I improved just working alongside her. She just gets it. I love that she can tap into being a mean adult who hurts my feelings and then into being just a fun, goofy kid." Martin's maturity and precision infused Little Jordan with a complexity and nuance rarely seen in performances by actors her age. "Little Jordan is dealing with the fact that she's pretended to be something she's not for so long," Packer says. "Adult Jordan's not really a mean person, but she's been a bully out of insecurity and fear. When she becomes little, she's stripped of that power and is forced to engage with people in a different way. That's what's great about Marsai's portrayal of Little Jordan. She had to have depth to show not only the aggressive bullying, but also her vulnerability. Marsai did an incredible job because that's a very difficult and delicate balance. I've seen actresses and actors with more years of experience handle it less deftly than she did." Where Martin's preternatural maturity comes from is a bit of mystery, but her confidence, drive and commitment to hard work have always been a part of her, according to her parents. "When Marsai was about eight years old, she asked me what a legend is," her mother, Carol Martin, says. "I explained it to her, and when she had a For Your Consideration event for Black-ish, they asked her what she wanted to be when she grew up. She said, 'A legend.'" Whatever that is within Martin that gives her that poise and composure, her parents have tried to encourage and preserve it. "We've always told Marsai that if she wants to do something, she can achieve it," Carol Martin says. Her father, Josh Martin adds: "I believe that parents need to listen to their kids and help them be creative. It's important to let them know that you're on their side and that you're an advocate for them. We just want to continue to see her flourish and do well." Marsai Martin is grateful for their support and guidance and for their unflagging belief in her. "My parents tell me that I can do anything every day," Martin continues, "that I can put my mind to anything I want to do, which has really pushed me to know that I can." Preston, played by Tone Bell, is April's co-worker at JSI. He's smart, creative and a little nerdy, and April is harboring a huge crush on him, but her lack of confidence prevents her from telling him how she feels"even though it's clear to everyone but her that he feels the same way about her. "Preston is cute," Rae says. "April would love for him to ask her out, but every time he comes around, she becomes too nervous. As Jordan so politely puts it, April 'can't close.' I'm sure April would love a chance to go out with Preston, but, like many other aspects of her life, she hasn't had a chance to talk herself into it." Bell brought an easy-going charm to Preston that proved perfect for the role. "Tone is super talented," Packer says. "His character is a little quirky. He's someone who supports April and is always telling her to pitch her ideas and have confidence in herself. I've known Tone for a while. He's a super-talented brother, and we were fortunate to have him in this movie." Connor, played by Mikey Day, is Jordan's biggest client, and he loves to throw his power around. He's cocky and the only person who can throw adult Jordan off her game. When he announces that he is pulling all his business from JSI unless Jordan and her team impress him with some new, out-of-the-box ideas, it sets off a chain of events and also cranks up Jordan's cruelty to her staff to an 11. And then, of course, she wakes up as a 13-year-old with the entire future of her company on the line. "The office setting scenes are fun and dynamic because we not only see Jordan in all her rage, but we also see Little Jordan come back to the office and overhear what people think about adult Jordan," Lopez says. "This strikes a chord with her and helps the evolution of her character." Day is one of the film's few male characters, and he and his fellow guys brought a fresh energy to their scenes. "Between Preston, played by Tone Bell, and Connor, played by Mikey Day, we get to see a little male interaction in the film that creates a great dynamic in the office setting," Lopez says. Trevor, played by Luke James, is Jordan's steady hookup, and he's eager to have a real relationship with her, but she's a woman with rules, and she keeps him (and all men, really) at arm's length so that she doesn't get emotionally involved. Trevor's feelings for her are totally sincere and he has zero ulterior motives, but Jordan refuses to trust him. "Trevor and Jordan have a 'friends-with-benefits' relationship," Hall says. "Actually, I think the benefits are mostly Jordan's. His nickname is 'D-boy.' Jordan doesn't let people get close to her, but for whatever reason, Trevor really likes her. He's so likeable and warm, which is the opposite of Jordan. So you think, 'Why does he stay with this woman?'" But when she becomes little, Jordan gets to hear what he really thinks about her, and it forces her to rethink him, and the possibility of a future with him, for the better. "Through the eyes of Little Jordan, she sees that Trevor genuinely likes her and doesn't have an ulterior motive," Hall says. "So their relationship is able to grow through his interactions with Little Jordan." Jordan also gets a reminder of how smokin' hot the guy is when she sees April's reaction to him when he shows up on Jordan's balcony one night, thinking he's surprising adult Jordan, and finds April and Little Jordan instead. "I think the moment April sees Trevor, she thinks 'Wow, Jordan is out here having all the fine pickings,'" Rae says. "She's impressed by what Trevor has to offer, and I think if she saw how Jordan treated Trevor, she'd be mad. Jordan has this great man who shows up, brings her flowers, sings, strips and serenades her with choreography and she's not grateful? I think April would only dream of being able to have that, and Jordan just doesn't even realize what it is." His appearance also adds some serious male eye candy to the film, which wasn't hurting anyone's feelings. "So, the movie is about the ladies"it's clearly black girl magic"but we need our brothers to support them, right?" Packer says. "I've known Luke for a while. He's a super-talented brother and he was great. Having him work opposite Regina and Marsai was fun. He got a chance to take his shirt off and do a nice little striptease routine, which he wasn't mad about." The whole black-girl-magic element of Little is set in motion by a little girl named Stevie, played by Marley Taylor. "Stevie is a little girl who is the face of the town's donut truck," Martin says. "She's a very sweet, smiley, cute and kindhearted person. She has a wand that she plays around with, which ends up being the wand that turns Jordan little in the first place. So after Stevie realizes that she turned Jordan little, there's a scene where she starts to try to make desserts appear out of thin air, and it's just hilarious." Martin adored working with her. "I love her so much," Martin says. "She gives the best hugs too. Marley is really great as this character." One of Jordan Sanders' coolest creations is a virtual assistant/smart speaker known as HomeGirl, voiced by Tracee Ellis Ross. "HomeGirl is a fictional device, kind of like if Cardi B and Amazon's Alexa were smashed into one," Packer says. "It's a smarthome device that hears everything you say and can react just like other home devices, but HomeGirl has way more flavor than your typical Alexa or Google. HomeGirl is dangerous and has a lot of attitude." The idea for HomeGirl came to Gordon in a moment of inspiration. "I thought of HomeGirl when I was reading an article about an artificial intelligent friend," Gordon says. "I laughed and thought, 'Wow, that would be the kind of friend Jordan would have.' The idea for HomeGirl was that Jordan didn't have any human friends but she had the ability to make one through technology." We "meet" HomeGirl in an early scene when adult Jordan wakes up to the device giving her positive reinforcement and encouraging her to get out of bed and take on the world. "HomeGirl is Jordan's best and only friend," Hall says. "She wakes Jordan up, tells Jordan to calm down, plays music and more. I mean, she does everything." Not only is HomeGirl a prime example of Jordan's brilliance, and how she has elevated technology from something nerdy into something infinitely cool, but the device is a breakthrough because it has the personality and voice of an empowered black woman. It breaks a glass ceiling, even if it's only fictional"for now. "It's basically an affirmation device for African-American women who wake up in the morning and need a word of encouragement," Lopez says. "It also executes commands and plays your programmed jams." And really, who wouldn't want that? On a film set teeming with impressive black woman, Tina Gordon's inspired vision and leadership dazzled everyone, starting first and foremost with Packer. "I think this is Tina's moment," Packer says. "She and I worked together years ago on a project that she wrote for me, but I always saw her as a dual threat of writer and director. She has such a great sensibility. People don't understand how tough comedy is. To have a comedy that really connects with people, it's a special thing, and I think Tina has a great handle on both character and comedy." Gordon created a positive, inclusive energy on set that motivated people to do their best work. She encouraged excellence and got it. "Tina's spirit as a director and writer on set is infectious," Lopez says. "She was absolutely amazing with the cast and crew." And her cast were thrilled to have her at the helm. 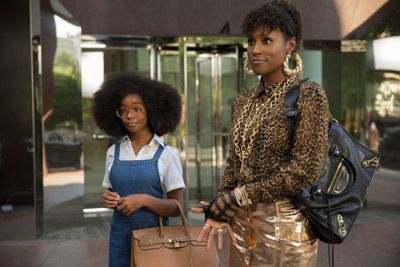 "Tina is a hilarious director," Rae says. "It also helped that she had a hand in the script and had a clear vision. She was so great at coming up with different ways for us to try things on camera." Hall admired her talent, her vision and the positive atmosphere she created on set. "Tina's so much fun and so encouraging," Hall says. "I've worked with her before, but this was my first time working with her as the director, and she had great ideas and a great vision. It felt different to have a woman behind the camera and getting her perspective and collaborating with her." Her young star, Martin, adds: "Tina is just a boss. She is so kindhearted and sweet. She's the type of director who will give you some time and freedom to do your own thing in your takes." She was also quite possibly the best-dressed director in history. "Tina's really stylish," Hall says. "I liked coming to work to see what Tina was going to wear. She always looks cool and comfortable, and effortlessly chic. So, she's dope." Most film comedies are not known for the beautiful cinematography. Scenes are usually shot for speed and laughs, not beauty. But cinematographer Greg Gardiner may have shot one of the most glamorous and attractive comedies ever filmed, brimming with exquisite light and vivid, energetic color. "I lucked out with Greg because he really saw the movie the way I saw it," Gordon says. "He brought his amazing creativity and ideas to the film. He just understood the aesthetics, script and moments of the movie. Greg is our white man magic." In the first scene of the film, set in the '90s, Little Jordan is humiliated at the annual student talent competition. When she's forced to go back to the same school, Windsor, trapped in her 13-year-old body, she finds herself confronting the same event, now known as WinChella. Her uncool Friend Zone pals want to perform a big dance routine, but Little Jordan is convinced they'll humiliate themselves and doom themselves to the social fringe for the rest of their school days if they do. She talks them out of it, but then, in a last-minute change of heart, she shows up at the event determined to get them on stage. "The pep rally scene is the big event of the year where Little Jordan attempts to show the other kids that you can be yourself and don't need to be worried about what others think," Packer says. "She ends up flat on her face in embarrassment in front of the school, but her point is proven because she went out and gave it 110 percent. This gives her crew the confidence to do their own performance, which of course, ends up being amazing." The result is the film's biggest set piece and pulling it off required military-level planning and execution. "The big pep rally scene in the junior high auditorium was definitely a production within a production," Lopez says. "We got music specifically composed for that scene, had choreography with our main cast, supporting cast and extras, and constructed a band from scratch. It's a huge set piece in the film. Tina and everyone behind the scenes put a lot of work into pulling it off." "I like the WinChella scene because of all the different elements it incorporates," executive producer Holmes says. "Producing this sequence started with finding the right people." They hired musicians Big Block 454, Drumline conductor Don Roberts and choreographer Sean Bankhead (FOX network's Star), who has worked with Beyoncé, Britney Spears, Usher, Ciara and more. "On the production end, the scene involved multiple cameras, a crane and hundreds of background extras," Holmes says. "It was a lot of fun for everyone involved and I think audiences will enjoy it." The music was inspired by Gordon's film Drumline. "Tina was a writer on the film and was intimately involved in the production, so that scene was paying homage to that," Lopez says. And Gordon herself was raring to take it on, despite the size and scale of the scene. "I really didn't think about how big the WinChella scene would be, but it ended up spiraling into something that was really big and fun," Gordon says. "I wasn't worried about the dancing because, as it turns out, kids can pick up dancing quicker than adults." Under the guidance of Sean Bankhead, the kids delivered on some serious old-school hip-hop moves. "He was amazing because he was able to incorporate comedy into the choreography," Gordon says. Packer was impressed: "This was my first time working with Sean Bankhead," Packer says. "The brother is super talented. I mean, his credits speak for themselves, but to work with him directly and have him choreograph primarily young kids and see what they can do is amazing. He finds the most talented kids and puts together amazing routines for them. He's really good. I'd work with him again in a heartbeat."